Nicknamed "The Truth," Williams' was best known for a long, stinging jab and his controversial losses to Larry Holmes and Mike Tyson in 1985 and 1989, respectively. With a pro career that spanned 15 years (1982-1997), Williams faced some of the heavyweight division's top fighters during that time and was arguably of one the best heavyweights in the last 30 years never to have won a world title. A highly-touted amateur, Williams won two New York Golden Gloves Championships before turning pro in 1982. The 6'4"/193cm Williams possessed a long 85 inch/215cm reach and used it to good effect, winning his first 16 bouts as a pro. 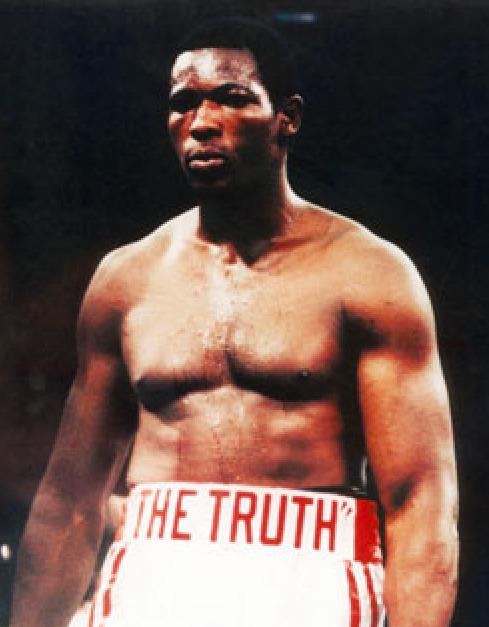 Carl 'The Truth' Williams (pictured) (then 16-0) came into prominence in May 1985 when he faced then-heavyweight champion Larry Holmes (then 47-0) on national TV. Only 25 years old and woefully inexperienced in comparison to Holmes, Williams gave the champion all he could handle through 15 rounds. As a matter of fact, some think 'The Truth' should have been awarded the decision but the judges ruled in favor of Homes' 143-142 and 146-139 (twice). "Even though it was a tough fight, I thought I edged him out in points, which I did in punch stats. But he was a popular champion at the time, and I said to him 'I'm going to push those legs into a journey of no return.' "
"It was a great, historic fight and a great introduction of myself to the public." Williams added, "Had I won that fight, my whole life would have changed." "I wouldn't have gone through a lot of the pain and suffering that I have. It would have set the stage for lots of good things. Instead it caused me to spiral down and people started to diminish me." Williams won an absolute war against Jesse Ferguson (then 13-0) just months after the Holmes fight. Down twice in the bout, Williams earned a 10th Round TKO, proving his performance against the champion earlier that year was no fluke. Williams told Doghouse Boxing seven years ago, "Getting off the floor twice to knock out Ferguson was the proudest moment of my life." "People forget that he was undefeated when I fought him, and how hard he could punch. His left hook was hard, man." During the summer of 1989, Carl 'The Truth' Williams (now 22-2) faced a 23 year old Mike Tyson (then 36-0) who was the undisputed heavyweight champion at the time. The bout ended after Tyson floored Williams with a left hook 93 seconds into the first round. In what is still one of the shortest fights in heavyweight title fights in history, Carl appeared lucid after rising but referee Randy Neumann would not allow him to continue. "I asked Carl twice if he was all right. He didn't respond. His eyes were dead. His legs were dead. So I stopped it," stated Neuman. But Williams insisted, "He knocked me down, I got up, and all of sudden the referee said I waited too long to say something. Then when he stopped it"
"He said, 'It's over.' Then I think I said to him, 'how much is Don paying you?' "
Incidentally, Tyson vs Carl Williams was the last time Iron Mike wore a cloak of invincibility as he would be KO'd 6½ months later by Buster Douglas. In January 1993, Carl Williams (then 26-5) got one last chance at stardom when he faced rising young heavyweight Tommy Morrison (then 34-1) live on HBO. In what was supposed to be a showcase bout for the surging Morrison, the fight was anything but. It was an all-out war. Williams was down in the 1st and 3rd rounds while Morrison tasted the canvas twice in the 5th round. Behind on two of the three scorecards heading into the 8th Round, Morrison would catch Williams with his signature left hook en route to forcing an eventual stoppage later in the round. The Morrison bout was the last for Williams as a highly relevant heavyweight contender as he'd lose 4 of his 8 remaining fights. With perhaps one of the most unique but catchy nicknames in boxing history, Carl Williams was most often refered to as Carl "The Truth" Williams by boxing fans. 'The Truth told Doghouse Boxing, " 'The Truth' came about because we used to say if you're the truth, you'll eventually come to the light, and that was evident in my case." "I adapted that name from the street, I guess. People used to say, 'you're bad, you're the truth'. I said, 'wow, the truth, I am the truth." "Just that I was honest and fair, that I was not a dirty fighter. And one day in my life, the baddest heavyweight in all the land, Larry Holmes, became the SECOND baddest heavyweight in all the land."